Since Willy gets off work early and I don’t have a steady job, we have decided to start going on happy hour dates. It’s a great way to enjoy the ambience of a nice restaurant without a colossal bill to pay at the end, like I mentioned I don’t have a steady job. 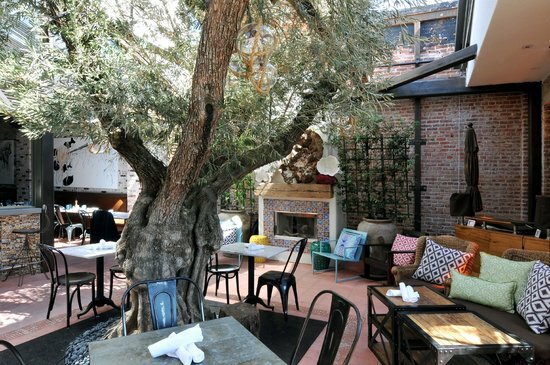 Last week we went to Herringbone, a charming lounge restaurant in the heart of La Jolla. If you’re not near San Diego, don’t worry it’s a small chain with locations in Las Vegas, NV; Santa Monica, CA; Waikiki, HI; and Los Cabos, MX. We decided to go to Herringbone due to its close proximity to Museum of Contemporary Art, where admission is free every 3rd Thursday of the month from 5p-8p. Plus I was really craving Oysters and couldn’t pass on the $1 price! Unfortunately, the museum was closed due to renovations, but we did get to check out the delightful Contemporary Fine Arts Gallery down the road. I definitely recommend going to that gallery if you are in the area! The ambience of Herringbone is superb. The indoor trees and eclectically sophisticated decor gives the place an upscale cottage feel. Bonus! They had beautiful live acoustic music that ensue every Thursday through Saturday. As for the service, it was attentive and professional. 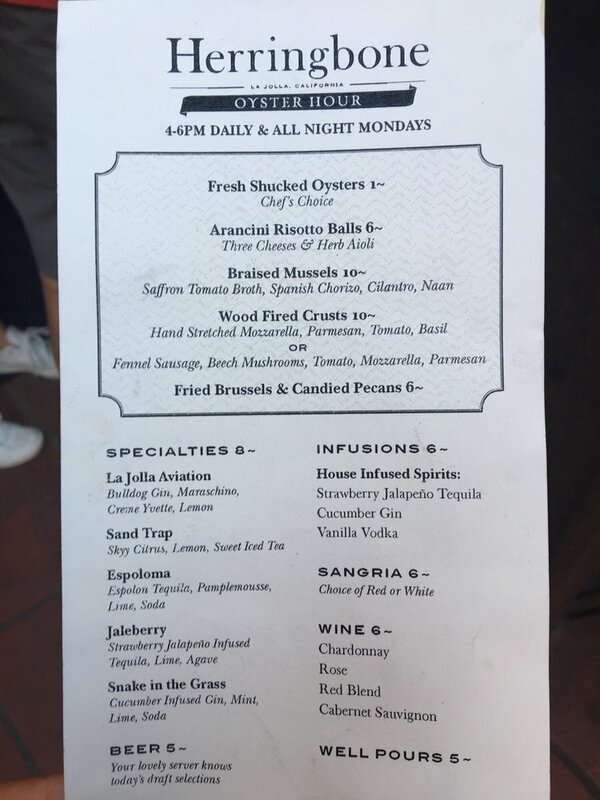 I was really craving Oysters that day so we ordered 6 of those to start along with a La Jolla Aviation for Willy and a Jaleberry for me. Everything came out quickly after ordering. The fresh, mostly large oysters were served with a half lemon, onion vinegar sauce, and cocktail sauce. Being the saucy that lady I am, I asked for a side of hot sauce. They promptly brought out Tabasco and Cholula, commencing our oyster palooza. We combined different sauces together and picked our favorite combos. The La Jolla Aviation was a well balanced cocktail, bitter with a dash of sweetness. The Jaleberry was a perfect blend of sweet and spicy. Although, I wished it had a salt rim. I’m a salt fiend. We like this order so much we went for a second round of everything after finishing the first, except this time with a salted rim Jaleberry. Tip: Don’t keep the sauces that come on the plate for the second round because they give you fresh ones regardless. I was just trying to save dishes but the chef doesn’t know who’s got sauce and who doesn’t. 12 Oysters, 4 signature cocktails, and 2 satisfied lovers came out to $48. A little pricey but not bad for a high-end, elegant restaurant where dinner plates are $30 and up! I was delighted with the service, ambience, oysters, and cocktails. I will definitely be returning to Herringbone for happy hour again. ← Ode to My Menstrual Cup and Why You Should Make the Switch!